Reel Talk Online: Here's the New Movie that People are Calling an "Oscar Contender"
Here's the New Movie that People are Calling an "Oscar Contender"
I love that we are eight months away from next year's Oscars and people are already trying to claim their awards contenders. I mean, I was hoping we could all veg out on a strict popcorn flick diet that the summer offers before we dive right back into the blood sport of awards debating. No? We have to talk about it now? Um, ok. In that case, the Cannes Film Festival activities are in full effect this week and with it has come a bevy of casting news and hyperbolic reviews (i.e. Nicole Kidman's Grace of Monaco is "the worst" movie and "Channing Tatum can be up for an Oscar" for FOXCATCHER). Let me let that marinate with you for a minute: CHANNING. TATUM. OSCAR. NOMINEE. You mean to tell me that the dude from Magic Mike and 21 Jump Street (and the forthcoming 22 Jump Street, and the inevitable 23 Jump Street and 24 Jump Street) may be nominated for an Oscar? LOLOLOLOL Well, this I have to see. FOXCATCHER is a rich and moving story of brotherly love, misguided loyalty and the corruption and emotional bankruptcy that can accompany great power and wealth. As with Academy Award® nominee Bennett Miller's previous feature films, CAPOTE and MONEYBALL, he explores large themes in society through his complex character portraits of real people. I'm not going to lie: that's a compelling synopsis and I am really intrigued to see it now. Although, I really didn't love Miller's Moneyball and have been generally unimpressed with the recent batch of sports films. Ruffalo, who I noticed is mysteriously absent from the ongoing awards fodder currently enveloping the film, also looks good in the clip (below). Also, I didn't even noticed Carrell, who's virtually hidden behind a mound of makeup. Hmmm...this could be interesting. 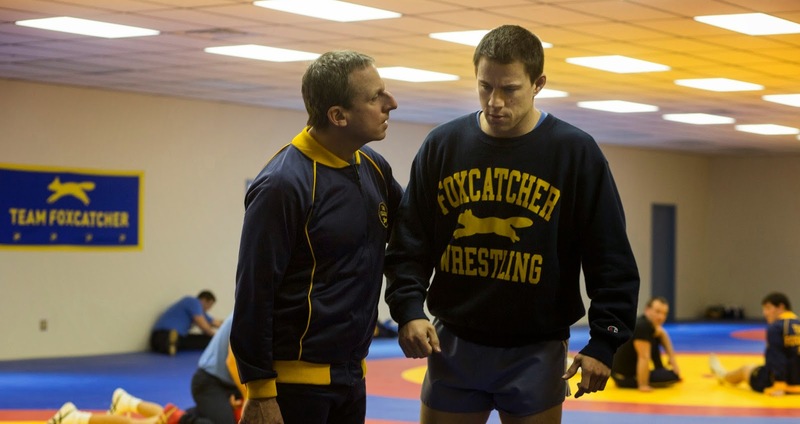 FOXCATCHER is in theaters November 14th. Come on...Oscar talk generates as soon as the ceremony ends, even before! That's the joy of Oscar watching :-) Tatum has been my big prediction since last year, when Foxcatcher was supposed to be a 2013 release. His reviews are pretty outstanding, and the role is the sympathetic co-lead and it's said that he carries the film really well. If he go Supporting (which is most likely will, against Carell's showier co-lead) then I can easily see him an Oscar nominee, like his buddy Jonah Hill. When I'd first heard of this film I was interested but didn't have any idea it'd start getting Oscar buzz. It's an interesting cast that could very well surprise us, Carrell has shown range before but Tatum, hmmm I'll wait and see.